A Pre-Employment Screening of Christ & Partners will give you more security. An applicant will always show himself of his best side. But can you trust a candidate on his or her word? It Pre-employment-screeninggives a realistic view of the Curriculum Vitae employment history? Are the specified credentials reliable? Research shows time and time again that candidates not always tell the truth. A recent investigation showed that 69% of respondents had lied in some way for his job. Sometimes this is 'only' to spice up his Curriculum Vitae. Most of the time it goes much further, such as training that are not followed or completed. And that's still only about the things that do matter on the Curriculum Vitae, because no candidate will spontaneously make mention of a criminal past. Because not everyone has got the same needs regarding a pre-employment Screening, so Christ & Partners provides various forms. You can choose phase 1 up to phase 5 which phase 5 is the most extensive pre-employment screening that we offer. This is the most basic form of Employment Screening at Christ & Partners. Screening phase 1 is meant for the In-Employment Screening. Screening phase 2 is intended for employees in a service job: service. Screening phase 3 is intended for qualified employees with limited accountability. 1 = We check the drivers license and the number also other relevant matters will be fully checked when it concerns a drivers function. A screening phase 4 is intended for employees with vital functions within your company. You can think of team leaders, planners and members of the management team. A screening phase 5 is intended for functions at management level, or members of the Board of Directors of your organization. For this screening we use the full PES model. What information sources does Christ & Partners have? We are a detective agency recognized by the Ministry of Justice that features a wide range of reliable information sources. In addition, we have several sources linked together, making the information readily available. Could I screen a business partner? Of course, for this we can make a customized proposal. For this we recommend you to contacting us by phone or by email. Will we hear the reason if we get a negative advice? Basically you only get a positive or negative opinion. We can provide any more information in agreement with the candidate. Some things ask a more nuanced approach than a clear yes or no. Because it is often confidential information, we agree with the candidate on this first. Must a candidate give permission? Yes, a Pre-Employment Screening is privacy sensitive. We therefore always ask the candidate written permission for our work. In practice, this is not a problem. A candidate who does not want to participate in a screening will generally not get far in the selection process. How will the screening work? The 'standard' forms of Pre-Employment Screening is the starting form the PES (PES stands for Pre-Employment Screening). The candidate fills in the form. Based on the data we get started. Then you receive a positive or negative recommendation of us about the candidate. What are the costs of a Pre-Employment Screening? This depends on the type of screening. This we will inform you during a personal (non-binding) acquaintance, or when you request a quote from us. It is also possible to close a framework agreement, with very favorable rates. In all cases, the costs weigh far outweigh the negative effects of a non carefully selected employee or business partner. In a customized screening we usually start interviewing a candidate. The personal data will be recorded and then checked by us. Optionally, is also held a psychological examination. Even with a customized screening you receive a positive or negative recommendation about the candidate. Of course, many things you can check by yourself. However that is something other than performing a targeted Pre-Employment Screening. 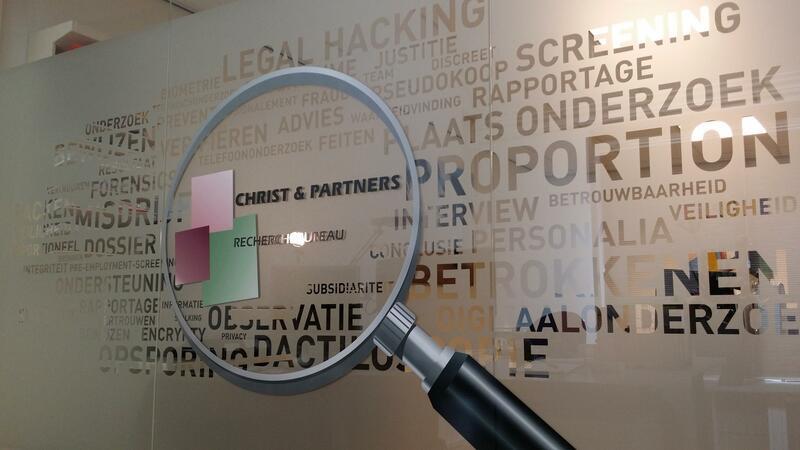 Christ & Partners Risk Security Management is a by Justice approved and registered independent consulting firm, which provides for the growing demand for security management and risk management. Our specialist knowledge and access to specific sources of information offers you a great advantage: more certainty about your staff. For a free consultation of more information, please contact us by filling in the contact form.